As an investor, your immediate financial goals could be getting that hi- tech gadget or a fancy car, but in the long run the areas you also need to focus on are wealth creation, your marriage, child higher education abroad, retirement planning, the list seems endless. While short term goals are fine and all of us would like to flaunt the latest iPhone, creating wealth for long term goals also cannot be put on the back burner infinitely and needs to start now. The process of wealth creation, retirement planning etc needs a long term investment strategy. It’s better to start now to obtain the full benefits of a long term investment plan. There are many vehicles for wealth creation however investment in equity mutual funds is the most suitable option, why? The immediate answer is wealth creation is a long term process. You need to be invested for long time to achieve wealth creation goal. The below graph can be consider as a proof how well equity markets perform in long term. In short run markets have always been volatile. Have you seen journey of Indian stock markets. Let’s look at the graph below, which has 6 months, 1 year and 10 years of BSE Sensex performance (closing average value of the month). By looking at the above graph you can easily understand that compared to 6 months, 1 year; volatility is much lower for the 10 year period. In first and second graph you can see markets has generate low return however in 10 years period markets has performed well which show the benefit of long term investment. 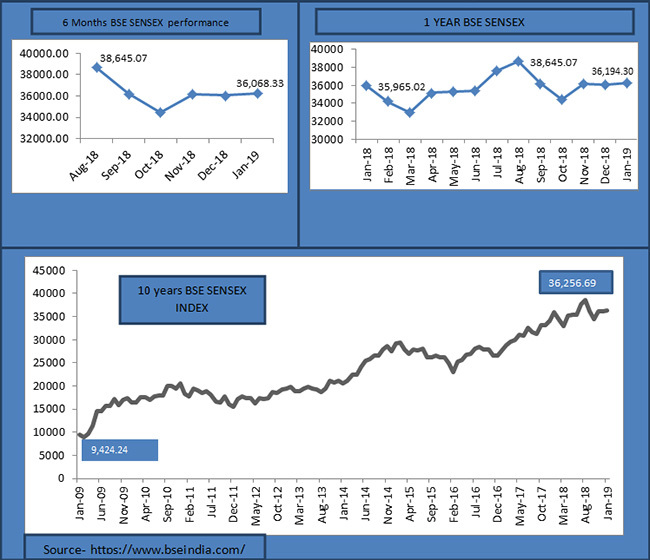 The BSE Sensex was 9,000 in Jan 2009 and in January 2019 index has crossed 36,000 mark. As stated above the equity market is indeed an advisable investment option for long term investments where volatility is less in long term than the short term. There are many ways you can choose to invest in equity markets however investment in mutual funds is an advisable route. Quantum Mutual Fund is the end of your search if you are planning for your investments (short term / long term). Quantum Long Term Equity Value Fund (QLTEVF) is the most suitable investment opportunity. The name of the fund itself highlights its features which are unique, like long term and value. 1) Value investment - Value investment is an investment style where the fund manager selects stocks based on value and not purely on price. In QLTEVF, Quantum Fund Manager selects stocks based on value and not purely on price of the stock. We have a specific investment philosophy which identifies stocks and then the investment takes place. The buying and selling decisions are based on this philosophy which works well in the long term and helps you to achieve your goals. Remember, value creation is a long term process. 2) Portfolio diversification - On an average, QLTEVF invests in 25-30 stocks which achieves the most important objective of long term investment – diversification. You can click here to see portfolio details of QLTEVF. The biggest advantage of diversification is minimizing risk in portfolio. If some stocks underperformed at the exchange, the outperforming ones can make up for the losses, indeed you cannot escape all risks but you can minimize it by way of diversification. 3) Professional Management - QLTEVF is a professionally managed fund by Fund Managers who are well aware about the Quantum Philosophy, investment process and style of value investment. Let’s convert your savings into wealth. Allow your money to grow.